The Everglades 273cc is the prefect hybrid, take an exceptionally well-built 27ft offshore center console and todays new bay boats that blend well with the family and the 273cc Everglades is that boat. The 273cc is a very versatile model that suites the needs for the family that wants to do a little bit of everything. 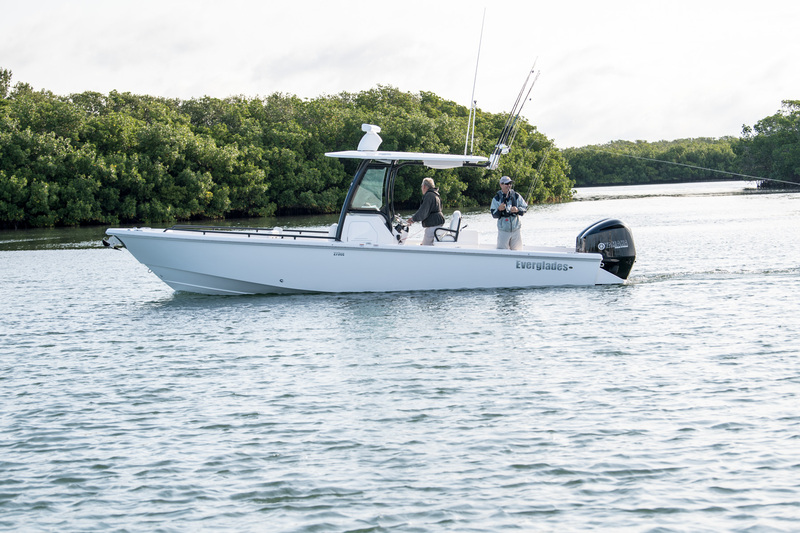 Whether that be fishing inside Tampa bay 2ft of water, running offshore in 200 ft of water, island hopping or just a sunset cruise the Everglades 273cc has the ability to make it happen. Starting at the transom the 273cc has a 20-degree dead rise to knife through the head sea but still plenty of beam at 9’3 to keep the shallow draft and stable at rest. 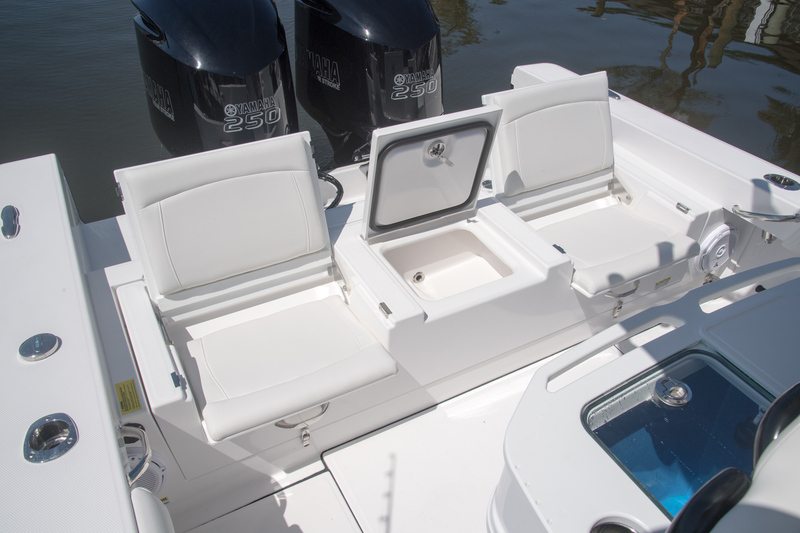 The transom has two-fold away jump seats that will be the most comfortable spot on the boat when running offshore but very well designed to keep the back deck clear when the seating is not being used. Moving forward to the leaning post we have a standard 31 gallon live well, sink with a cutting board and tackle storage port and starboard. 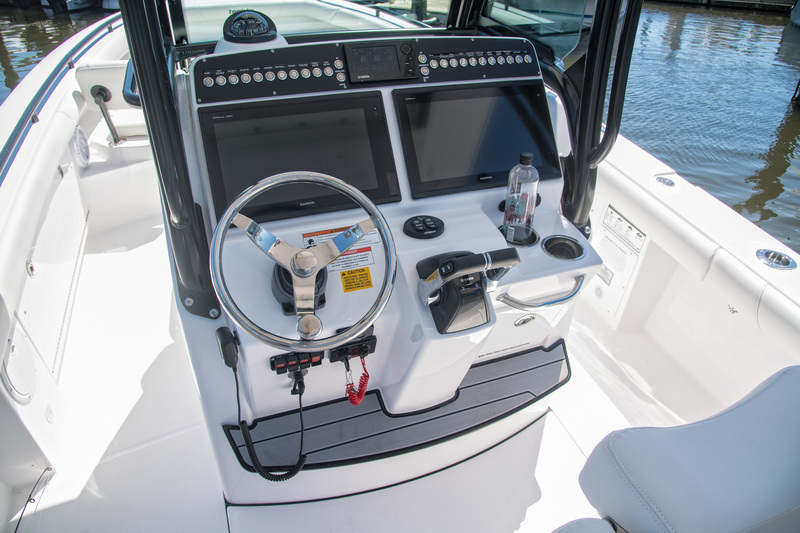 At the helm you have ample room for electronics, two flip up heavy duty bolsters, hydraulic windshield and ergonomic helm with great slight lines when docking. In front of the helm in the bow of the boat we have a seat with a heavy insulated cooler underneath that drains directly overboard. We also have the floor 82 gallon insulated fishbox with pump out, as well as two storage/rod locker boxes port and starboard. 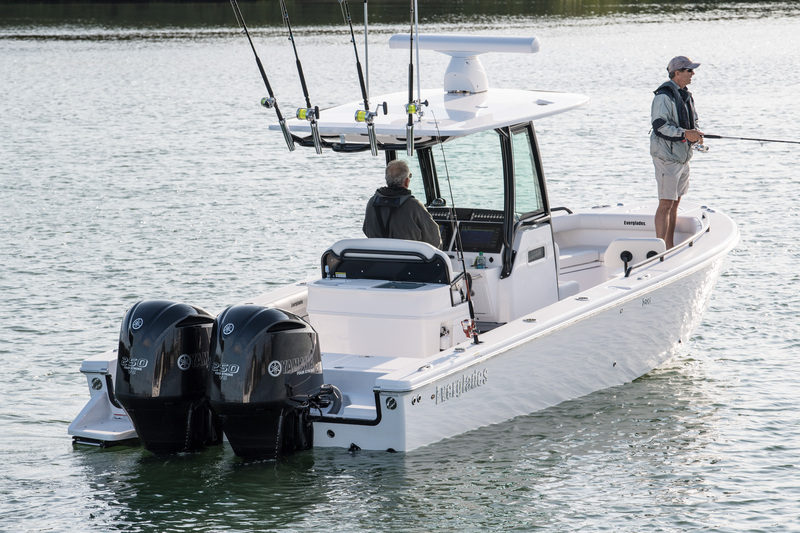 The 273cc has a deep bow with more freeboard than most other hybrid bay boats keeping to safe and dry. The Everglades 273cc is a great performer in most weather conditions. With her twin 250 Yamahas you can push this boat over 53mph and cruise in the low 30s, giving you over a 280 mile range at cruise. There are not many other boats 27ft that have s spacious layout, soft smooth ride and still only draft 18 inches of water. Like all Everglades the boat is unsinkable with a self-bailing cockpit for an added peace of mind out on the water. Come take a look at our Everglades 273cc today at our Clearwater showroom location.